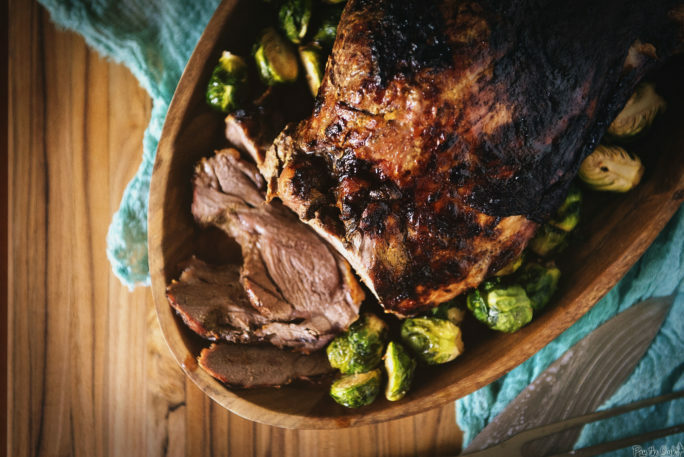 This is an easy ‘fried’ honey dijon leg of lamb, perfect for any holiday, cooked in an outdoor oil-less fryer. Yep, crazy good and minimal clean up. It’s that time of the season when every single outdoor cooking enthusiast is watching and re-watching Alton Brown build an elaborate pully system for deep frying the perfect turkey. Everyone is getting all pumped and excited to go bigger and bolder with an award-winning turkey recipe for Thanksgiving. And then Char-Broil went and did this. They used their magic to build an amazing, safe, and easy to use turkey ‘fryer’. And it doesn’t even use any oil. No oil. You read that right. That means it’s far safer than that bubbling vat of boiling oil my father set up last year. And all for wildly good results. With the Char-Broil TRU-Infrared™ technology (read: wizards and magic and stuff) the oil-less fryer ‘fries’ perfectly. 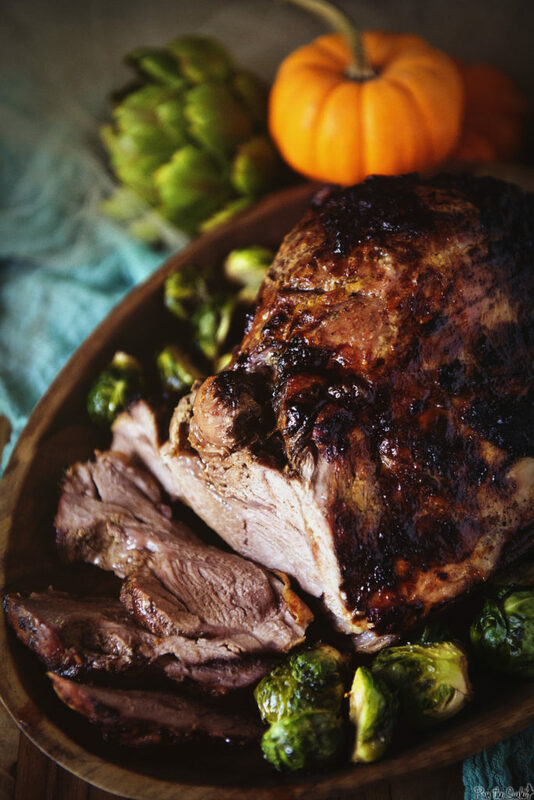 Crispy skin on the outside, moist, flavorful meat locked inside. And without all that artery-clogging oil, it’s healthy. Think of the possibilities. Like pork belly, vegetables, giant turkey drumsticks, stuffing, lamb, pork, chicken, snacks, fancy crown roasts, and more. This isn’t the one and done novelty that loses its flair after the first turkey. Want to see how creative you can get? 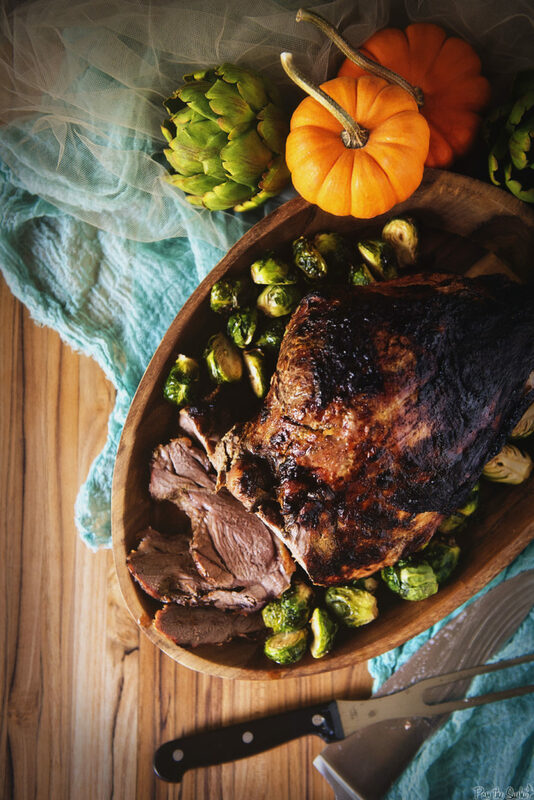 Check out the Char-Broil Community Page for some inspiring Big Easy Oil-less Turkey Fryer Recipes. The Big-Easy has earned a spot on the back deck snuggled permanently between the smoker and charcoal grill. Be sure to go check out all of the cool options and ideas that Char-Broil’s Big Easy Turkey Fryer can offer. I was able to test out this new technology in my own backyard and I fell in love instantly. First, I was a little confused as to just ‘how’ it cooked. But after putting faith in the crew at Char-Broil, I sat back and let a little magic happened. Instant fan. So much so that my own pop’s is now doing his bonus turkey in a Big Easy Oil-Less Turkey Fryer for our own family Thanksgiving. (Lucky for him, he has a daughter that owns one). 😉 In all, I worked with 9 other food writers, testing out these ‘fryers’ and each one of us raved about them. Talk about stepping up the Thanksgiving a-game. Season your new Big Easy Oil-Less Turkey Fryer before you cook something. Let it get a nice coating on the sides before testing out your first recipe. When cooking, grease the cage. Then grease it again. Seriously, the better that baby is greased up, the easier clean up. Bring your poultry or pork. If you are cooking a turkey or hunk of pork, settle the meat into a brine the day before cooking. Let the salt water bath work it’s magic on bringing out some bonus flavors. Want to fry smaller veggies? Use metal kabobs to skewer the veggies and arrange in the basket. Use heatproof gloves to safely arrange and remove the veggies when done. Temp your meat. Use the thermometer that comes with your Big Easy Oil-Less Turkey Fryer to make sure your feast is cooked to the perfect temperature before removing too soon. Prep your Big-Easy Oil-Less Fryer and place the lamb in the basket. Put the basket in the fryer and cook until the lamb registers 145 degrees F for medium rare. With gloves, carefully remove the lamb and wrap with foil. Allow to rest while you toss some veggies in that Big-Easy and let them get all nice and crispy. Slice the lamb and serve. Char-Broil sponsored this post, sending a Big Easy Oil-less Turkey Fryer and stipend for ingredients my way with no obligation for a positive review. I am genuinely excited about this product and happy to share it with my readers. All thoughts and opinions are my own. Oh my friend. I am in love. 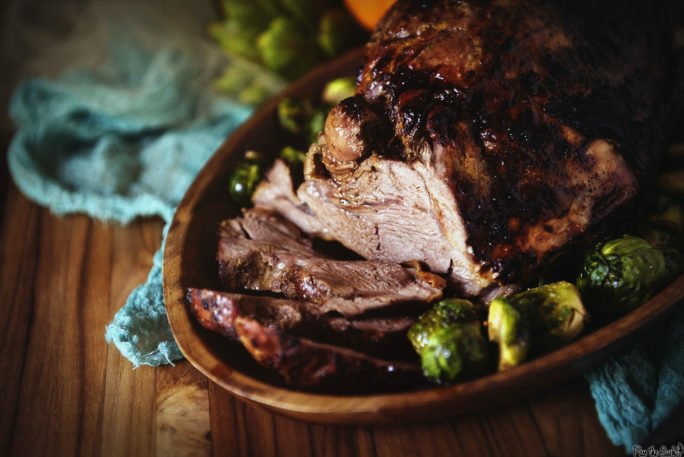 Lamb is my absolute favorite meat and that roast is cooked to perfection. Seriously. I could easily devour the whole thing. I love lamb too – it looks incredible! I’ve never been a fan of lamb, but this recipe is making me rethink that decision. Obviously a fried turkey would be in order! A turkey of course! Just think of all the things you can make with the leftovers. The first thing I would make in your Big Easy Oil-less Fryer is fried chicken. I am a fried chicken fanatic! If I had this Big Easy Oil-Less Fryer on Thanksgiving the first thing I would make is a Créole injected turkey. I need this in my life!!!! The recopies sound awesome, the pictures of look great, if you’re a fat guy on a diet your screwed. I just thought of something, Lamb is OK but a brisket would be out of this world, I have got to try this. Looks so yummy! Pictures look so good. Did you find the honey burned when you made this? How long did your lamb take to cook, to get to the proper temp? Hi Simeren, There isn’t an exact time, as each cut is different but try for 15 minutes per pound for your roast. Using a good instant read thermometer is super important to make sure you don’t over cook the meat. Cheers!